Time for a top-10 list. Sorry, Abe, you may have been our greatest president, but the movie Lincoln didn’t make my cut. Sure Daniel Day-Lewis is on target for an Oscar nomination for giving the 16th president a folksy veneer that masked his toughness. But overall, I found it easier to appreciate Steven Spielberg’s beautifully detailed movie than to become involved in it. My number one pick, The Master, confounded many. I get that. But I also thought director Paul Thomas Anderson’s latest work was haunting and strange, an encompassing view of post-war America that, at least in my opinion, should be taken as commentary rather than as a reflection of reality. Among the documentaries I admired in 2012 were The Gatekeeper, The Imposter, Searching for Sugar Man and The Central Park Five. The Central Park Five and The Gatekeeper are still opening around the country. If you miss any of these docs ... well ... that’s what Netflix is for. Among other observations: It seems 2012 was the year in which Matthew McConaughey proved that he’s a better supporting actor than a leading man with impressive performances in Magic Mike and Bernie. Beasts of the Southern Wild , which will find its way onto many 10-best lists, probably deserved its status of the year’s best-reviewed indie. The movie also earned praise for non-actor Quvenzhané Wallis, who played a six-year-old girl learning how to survive in a Louisiana backwater. Moonrise Kingdom strengthened director Wes Anderson s position with his loyal fans. It also should be mentioned that the theatrical experience took on a new dimension in Aurora, Co., where shooting no longer was confined to the screen. After Aurora, I noticed no decline in the number of weapons that found their way onto the big screen. Sept. 11 didn’t put an end to explosive violence, and I’m betting that we’re not likely to see any gun control on the big-screen in the wake of 2012’s Aurora carnage or the recent school shooting in Connecticut. I hope Hollywood proves me wrong. 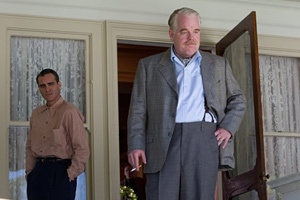 Director Paul Thomas Anderson’s movie focused on a strange rivalry between two men (Joaquin Phoenix and Philip Seymour Hoffman). Terrifically acted and almost mesmerizing, The Master boasts some of the year’s most exciting filmmaking. Like other of Anderson’s movies, The Master may require multiple viewings to appreciate and fully absorb its thoroughly disquieting tone. Phoenix plays a wayward, alcoholic war veteran who falls under the sway of a cultish leader (Hoffman). Director Kathryn Bigelow follows The Hurt Locker with another tough-minded topical thriller, this one about the quest to capture or kill Osama bin Laden. As she did in The Hurt Locker, Bigelow avoids taking a position about what we’re watching — in this case numerous scenes in which CIA operatives torture a captured al Qaeda terrorist in hopes of obtaining valuable information about bin Laden’s whereabouts. Bigelow’s straightforward approach to a complex story allows us to reach our own conclusions about what we’re seeing. An outstanding Jessica Chastain portrays a dedicated CIA agent whose persistence leads the CIA to bin Laden. Sure we know how the story ends, but in this case, it’s how the movie gets there that counts. French couple in their 80s (Jean-Louis Trintignant and Emmanuelle Riva) are the centerpiece of a touching story about what happens when a perfectly contented husband and wife face a sudden decline. Director Michael Haneke (The White Ribbon) softens his usual hard edge, but still delivers an unblinkingly honest look at love, grief and adjustment to the inevitable. Wonderfully seasoned actors, Trintignant and Riva are excellent, but it’s Trintignant who eventually carries the full burden of the movie’s considerable weight. Not perfect, but a lovable rom-com that challenges formula without surrendering its humanity. A mentally disturbed former teacher (Bradley Cooper) meets his match in the person of a widow (Jennifer Lawrence) with a personality that’s ... well ... Philly strong. Robert De Niro and Jackie Weaver provide able support as the parents of Cooper’s Pat. A little loopy and a lot of fun, this one is augmented by genuine emotion and (of all things) a whacko dance contest. I was braced for the worst, but director Ang Lee manages a lovely big-screen adaptation of Yann Martel’s wildly popular novel. The CGI effects are nothing short of miraculous, and the story contains enough ambiguity to keep even confirmed cynics from rolling their eyes. As young Pi, newcomer Suraj Sharma gives an extraordinary performance. Lee’s fable about a boy shipwrecked with a full-grown Bengal tiger transports us to a richly imagined and ultimately rewarding world. Aside from a small misstep at the very end, Ben Affleck’s thriller generates both humor and tension in telling the story of CIA-concocted ruse to save a team of American diplomats who had taken refuge in the Canadian embassy during the 1979 hostage crisis in Iran. Alan Arkin and John Goodman are terrific as the Hollywood guys who help Affleck’s Tony Mendez carry out a plan in which Mendez poses as the director of a fake film crew that enters Iran under the guise of scouting locations for a sci-fi movie. Israeli director Joseph Cedar puts his characters into a vice and squeezes until it hurts. A father and son — both Talmudic scholars — find themselves in a testy, competitive relationship in this acutely intelligent look at what happens when a son enters the family business (in this case, academia) and surpasses the father. Lior Ashkenazi plays Uriel, an honored scholar who takes an intuitive approach to his work. His father (Shlomo Bar-Aba) prefers meticulous fact-oriented research. Footnote turns into a work of biting wit and smart observation. Christopher Nolan wraps up his Dark Night trilogy in gripping fashion. The release of Dark Knight Rises was tainted by the Aurora shooting that took the lives of 12 people on the film’s opening night. If that shooting put you off Dark Knight, you may want to get the DVD and give it a try. Credit Nolan, Christian Bale, Anne Hathaway, Tom Hardy and Joseph Gordon-Levitt with bringing the series to an intelligent conclusion. If Dark Knight Rises offered a forbidding vision of a world in which no one can feel totally safe ... well ... connect the dots for yourself. Filmmakers aspiring to make period pieces owe it themselves to take a look at Benoît Jacquot’s pulsating drama about the last days of Marie Antoinette (Diane Kruger). The story centers on a servant (Léa Seydoux) who lands the job of reading to the queen. Jacquot breathes urgency into every frame of a movie that concludes with a twist that’s both horrific and chastening. In the bargain, he takes us into a world in which denial has replaced hope. The always versatile Richard Linklater directed the year’s best comedy, which is saying quite a bit when you realize that he was telling the story of a real-life murder in which a former undertaker (Jack Black) bumped off a despotic widow (Shirley MacLaine) whose bullying ways made her the least popular person in the tiny town of Carthage, Texas. Black and MacLaine couldn’t be better. Same goes for Matthew McConaughey, who plays the DA who prosecutes Bernie. A real-life tale bolstered by the participation of some real Texans.